Measurement of the level of variation of plant and animal species in a particular habitat or region. Texas is home to over 540 species of birds and 1200 species of animals, more than any other state. The plant life of North Central Texas is particularly spectacular with over 2220 native species. North Central Texas, a region roughly the size of Kentucky, cuts across two physiographic zones with distinct habitat regions; the Blackland Prairies and the Cross Timbers and Prairies. Each boasts a rich, diverse wildlife population. 1. Western Cross Timbers. 2. Grand Prairie. 3. Eastern Cross Timbers. 4. Blackland Prairie. Physiographic zone boundaries are typically determined by physical factors of the region such as geology, soil type, annual rainfall, and climate. These factors also control the distribution and the vitality of the habitat building blocks; vegetative cover (shelter) and wildlife food sources. The climate in North Central Texas is somewhat uniform with small differences in annual rainfall, annual averages increasing toward the east. The primary controller for habitat diversity in our region is the geology. Distinct soil types controlled by the local, underlying rocks determine the plant life it can support. 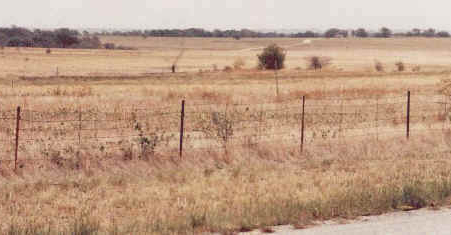 The easily-eroded Cretaceous shale and marl of the Blackland Prairie geology with decaying dead grasses produce the rich, black soils in flat to gently rolling topography where grasslands predominate. The more erosion-resistant rocks underlying the Cross Timbers areas produce soils more conducive to supporting mixed oak woodlands and prairies. Increasing elevation coupled with decreasing annual rainfall westward is a secondary controlling factor in habitat distribution throughout North Central Texas. A large portion of native wildlife habitat in North Central Texas has been given over to urbanization and agriculture. Many of these precious resources are gone forever. The Urban and suburban culture can coexist, however, with its wild, natural counterpart, but only if wise resource management is applied. Each of us as citizens of North Central Texas is responsible and accountable to our creator for the stewardship (1) of our natural heritage by working toward sustainability within our communities. We typically operate by allowing government to act as our accountable, responsible proxy in management of our resources (yes, the natural resources belong to us, the citizens of Texas). Do you know how your representatives are doing with the management of your natural resources? The Texas Parks and Wildlife Division, the Texas Natural Resource Conservation Commission, and local branches of the Texas Agriculture Extension Service and Master Naturalists are excellent information resources in this regard. The Cross Timbers and Prairies region is a transitional bioregion for many plants and animals whose ranges extend northward into the Great Plains or eastward into the forests. This region was named by early settlers who traversed belts of oak forest crossing strips of prairie grassland. The average annual rainfall range is 28-40 inches per year. 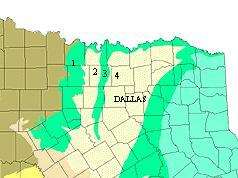 Upland soils are light colored, acidic sandy loam or sands. Bottomland soils may be light brown to dark gray and acidic with textures ranging from sandy loams to clays. The landscape of the region is gently rolling to hilly and elevations range from 300 to 800 feet above sea level. The region can be described as oak savannah where patches of oak woodland are interspersed with grassland. A significant amount of information regarding the cross timbers woodlands can be found at the The Ancient Cross Timbers Project web site. The Blackland Prairies region is named for the deep, fertile black soils that characterize the area. Blackland Prairie soils once supported a tall grass prairie dominated by very tall-growing grasses such as big bluestem, little bluestem, indiangrass, and switchgrass. Because of the fertile soils, much of the original prairieland was plowed by settlers to produce food and forage crops. Today it serves the same purpose and little of the prairie in its original form remains. The average annual rainfall ranges from 28-40 inches. Typically, soils are uniformly dark-colored alkaline clays, often referred to as "black gumbo", interspersed with some gray acidic sandy loams. The landscape is gently rolling to nearly level. Elevations range from 300 to 800 feet above sea level. Links to resources and additional information regarding North Texas biodiversity and habitat management can be accessed from the top navigation menu.